What’s in a name? That which we call whisky by any other name would taste just as sweet. At least that’s what the Indian whisky industry seems to believe, since 90% of the whisky made in India is made from molasses, not from any grain. (I do hope Shakespeare didn’t turn too violently in his grave for my brutal mangling of his writing.) That said, I’m sure this issue of Indulge has plenty to talk about appreciating good whisky in its purer forms. And I’m just a chef, not qualified enough to be a whisky snob, so I’ll just focus on using it in different ways in food. Whisky can complement a variety of flavours and add punch to sauces, marinades and stews. Before I get around to that, two important issues need to be settled: what kind of whisky should you use, and does the alcohol in whisky really burn or evaporate when it’s used in cooking? Now let’s move to a popular misconception propagated in many a cookbook about how much alcohol is actually left behind after cooking. 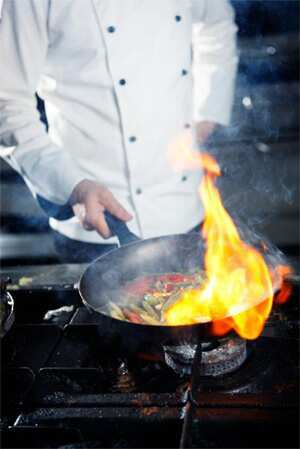 Many people believe that most of the alcohol in any spirit evaporates in the cooking process. This isn’t true. 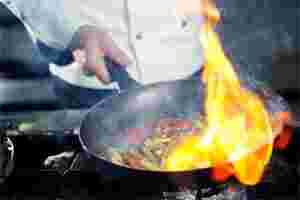 In scientific tests conducted by the US department of agriculture, it was found that after flaming (as in a flambé), 75% of alcohol remained in the food. Simmering for 15 minutes left 40% of alcohol behind, and even after an hour of cooking, 25% remained. While this may not bother you if you only use a few tablespoons for flavour, it’s something you should know if cooking for children, people allergic to alcohol, or those who don’t consume it for personal or religious reasons. Boring scientific part now behind us, let’s see how we can use whisky in food. One of the popular uses is to incorporate it into sauces, both sweet and savoury. Unlike wine, whisky is splendid with creamy sauces. Here’s a variant of a classic pepper steak sauce using whisky: sauté your meat in a stainless steel or cast-iron pan until it’s done, remove and set it aside. Your pan should have some tasty brown bits from the meat. Oh, you’re vegetarian? You may not get the meaty flavours, but you can do the same with pan-fried potatoes and even a dry Indian sabzi dish. Take the veggies out of the pan, heat the pan till the masala bits are dried up, and then do as above (but leave the herbs out). Indian veggies, western whisky pepper cream sauce. Like some matrimonial ads say, it’s a perfect blend of eastern and western values. On the other hand, whisky can be used in desserts. Just as whisky’s flavour goes well with cream in savoury sauces, it does the same in sweet sauces. A simple ‘‘whisky cream sauce" for dessert involves stirring sugar and whisky into some heavy cream and letting it simmer for a while till it reduces to a consistency you like. Some folks like to thicken it with corn flour, but that’s up to you. Use it to go with puddings or Christmas cakes. Or work whisky into a caramel sauce, possibly with some added orange—delicious! Dry fruits such as figs, raisins and blackcurrants, and nuts such as hazelnuts, walnuts and almonds are natural partners for whisky, and their flavours complement each other brilliantly. Try crushing a few nuts and dry fruits and let them infuse in whisky for two-three weeks. You should get some tasty homemade liqueur at the end. Lastly, whisky is a nice partner for chocolate. There are whisky connoisseurs who do pairings of single malts and chocolate. As I said before, I’m not qualified, so I just use it in chocolate sauces or desserts, preferably those on the darker chocolate side, i.e., more chocolate, less dairy. If you like chocolate mousse, try adding some whisky into your mix. I’ve successfully made an ‘‘Irish coffee mousse" by incorporating coffee and chocolate in a chocolate mousse, and it was darn tasty. I hope I’ve given you a starting point for your own cooking adventures with whisky. There are plenty of variations in the above to keep you going for a while. Find your own winning combination and let me know how it worked out for you.